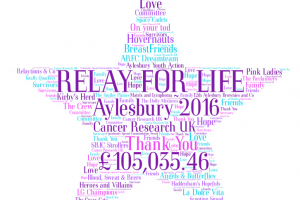 Relay For Life Aylesbury 2016 has broken the £100,000 barrier for the third year in succession – and won a special commendation from Cancer Research UK for its efforts. The 2016 total was announced on Friday (September 15) when it was revealed that the 25 teams of 501 Relayers had raised £105,035.46 both during the 24-hour event, and with numerous fundraising events throughout the year. 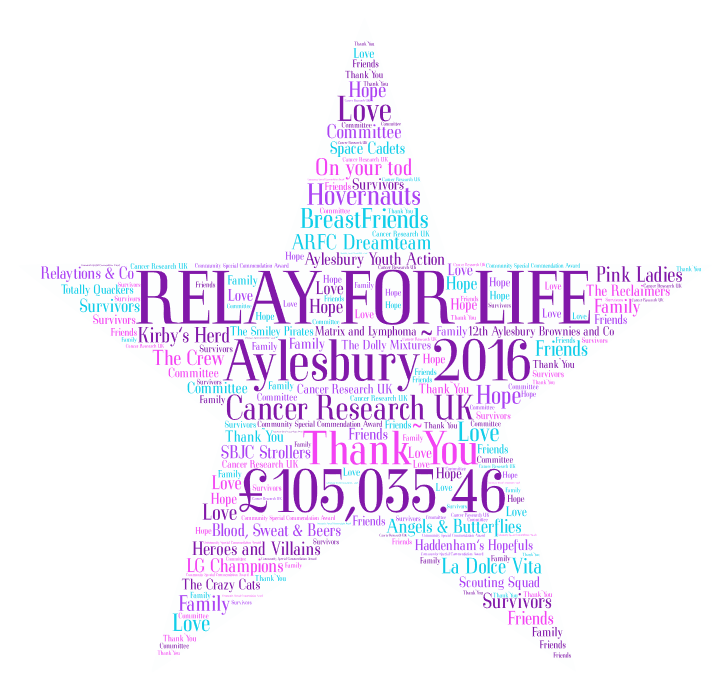 Since Relay launched in Aylesbury in 2009 the event has now raised an amazing £553,014.46. “It’s a staggering amount of money to raise and we know at CRUK how much hard work has gone into every single pound of it. There are very few Relays that raise more than £100,00 so it puts Aylesbury on the map of fundraising Relays in the country. But also, the thing that struck me, both at the weekend and here tonight, is the incredible atmosphere and energy and camaraderie that I think Aylesbury does brilliantly and that’s why you are such worthy winners of the Flame of Hope Special Commendation,” said Lucy Edie. “Our teams, supporters, their friends and families continue to amaze us every year with their incredible hard work and effort. As a committee we have been blown away by the Fundraising in The Community Special Commendation Award. I love what we do and I couldn’t be prouder of the event we create. Relay For Life Aylesbury 2017 will take place from 12 noon on Saturday July 1, 2017, at Aylesbury Rugby Club. To receive information about the event when it opens for registration in November please email relayaylesburyteams@gmail.com.